Monoecious tree to 30m tall, to 0.8m d.b.h. at maturity; trunk straight. Crown In mature trees conical or columnar but open, apex rounded or pyramidal, sometimes wider than the lower crown. Bark to 2cm thick, exfoliating in horizontal strips, forming horizontal bands or flakes in the largest trees. Leaves on mature trees of two kinds: adult and semi-juvenile. Adult leaves have a rhythmic variation in leaf size and spread along foliage branchlet; the size shape and range is ovate-broadly lanceolate, 5–10 × 3–6mm, apex incurved. Those on the penultimate branches shorter than or scarcely exceeding the diameter of their attachment base. Stomata on adult leaves on both surfaces, 10–14 discontinous rows each side of keel. Male pollen-cones confined to higher parts on primary branches, terminal, initially erect but pendulous when shedding pollen. Cones cylindrical, initially straight becoming curved at maturity, 60–70 × 15–20mm. Female seed-cones terminal on short, stout foliage branches which widen below the cone, usually solitary, sometimes 2–3 together, erect. Mature cones green, subglobose, usually slightly longer than wide, 9–11 × 8–10cm., with a truncate apex. Seeds obovoid-oblong, 20–25 × 8–10mm, ripening light brown. Araucaria biramulata has the unique combination of characters which include: adult leaves on the penultimate branches shorter than or scarcely exceeding the diameter of their attachment base; rhythmic variation in adult leaf size and spread along foliage branchlets; lateral extensions at the base of adult axis leaves absent. 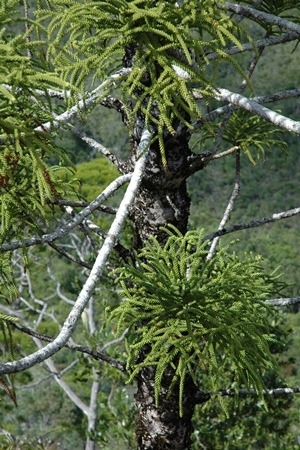 The most similar species are Araucaria bernieri, A. scopulorum and A. humboldtensis. 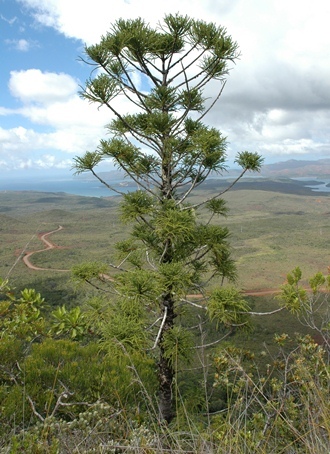 Araucaria biramulata is primarily found in the southern part of New Caledonia although two localities are known from isolated ultramafic massifs in the north. 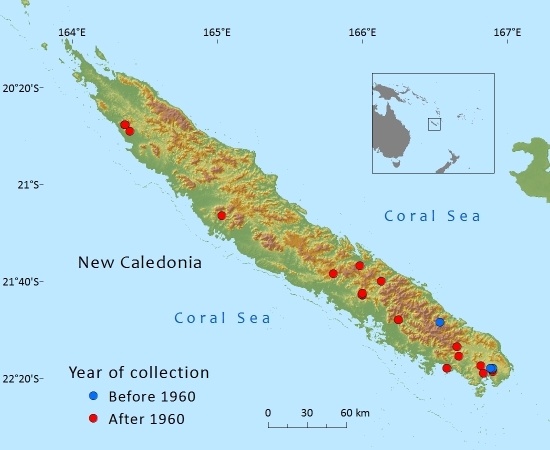 Occurs from 190 to 1,150 m. The total population size is estimated to be less than 10,000 mature individuals; no single locality or subpopulation contains more than 1,000 trees. Mainly found as a scattered emergent tree in dense humid evergreen forest at low to mid altitudes and in areas with 1,500 to 3,000mm precipitation. It is restricted to ultrabasic soils. This species qualifies for Vulnerable on the basis of its limited extent of occurrence, the severe fragmentation and ongoing decline of its subpopulations due to fire and mining. The number of mature individual is estimated to be less than 10,000 with no subpopulation containing more than 1,000 mature individuals. Open cast mining and its associated activities are the principal threats in the northern part of its range (Mt Kaala/ Piton de Pandoup and Kopeto). Southern populations, including those in protected areas are mainly threatened by fires which prevent regeneration and increase fragmentation. Well-protected subpopulations exist in Rivière Bleue Provincial Park. Thomas, P. (2010). Araucaria biramulata. In: IUCN 2012. IUCN Red List of Threatened Species. 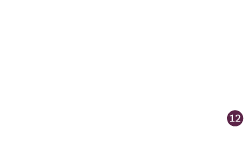 Version 2012.1. www.iucnredlist.org . Downloaded on 29 June 2012. P.I.Thomas,T.Jaffré ,J. Munzinger,and P.P. Lowry , 2013. Araucaria biramulata, from the website, Threatened Conifers of The World (http://threatenedconifers.rbge.org.uk/taxa/details/767).